Solar panels – Absorb the sun’s rays as a source of energy for generating electricity. Inverter – Converts power generated by solar panels into useable electricity. Meter – Tracks how much electricity is generated, used or fed into the power grid. Balance of system – Includes all components beyond the actual solar panels, including wiring, mounting systems, inverters, switches, battery banks and more. But don’t stop there. A little research can go a long way. Reduces operating expenses by lowering electricity costs. Helps advance environmental and sustainability goals. Offers a low-risk investment option to increase commercial property value. Contributes to corporate social responsibility. A well-crafted request for proposal (RFP) that engages key leaders in your company can help you find the best fit for a relationship that should continue for many years. WHERE SHOULD YOU PUT YOUR PANELS? Rooftop – Requires consideration of roof integrity and angle, as well as the area’s climate, when you install solar panels on commercial buildings. Ground-mounted – Takes advantage of large open spaces, but you must also carefully evaluate ground slope, shade and climate. Carport – Provides covered parking along with renewable energy, but you need to have an open parking area. WHAT SIZE SOLAR PANEL SYSTEM DOES YOUR BUSINESS NEED? Review a year’s worth of electricity bills to figure out anticipated energy requirements. Calculate electricity costs based on current utility rates and schedules. 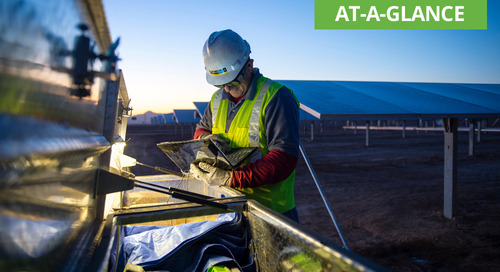 Take into account panel efficiency and yield, plus irradiance (the rate sunlight hits a surface) to estimate how much energy the solar panels will produce. WHICH FUNDING OPTION WORKS BEST? Choose the right commercial solar financing option based on your needs and future plans. Purchase – Enjoy all the benefits of owning a solar installation directly. Lease – Pay a monthly fee for the solar equipment and benefit from the energy produced. Power purchase agreement (PPA) – Host a system owned and operated by a third party and buy the solar electricity produced. Learn more in How businesses and public entities can pay for solar. Once your solar installation is complete, begin enjoying the benefits of your solar investment by generating your own clean, renewable energy.